Waves’ latest plug‑in takes us into the bowels of the world’s most famous studio! While not everybody gets to record at London’s most famous studio, Waves have made it possible to add some genuine Abbey Road flavour to your recordings, with plug‑ins that model the studio’s reverb plates, tape machines and vinyl‑cutting systems. The latest of these is Abbey Road Chambers. Developed in collaboration with Abbey Road Studios, this plug‑in replicates the acoustic spaces that have been used as reverb chambers, and the hardware that was used to capture the sound, including a tape delay integrated into the signal path that was used to extend the reverb decay time. This setup was used on countless classic recordings in the ’60s and ’70s — including some Beatles tracks — and the sound is still valid in today’s world of digital reverb. As is usual with Waves plug‑ins of this type, different components are available for mono, stereo, and mono‑in/stereo‑out processing. The signal chain feeding the chambers was given the name STEED, standing for ‘Send, Tape, Echo, Echo, Delay,’ and comprised a buffer stage, a tape‑delay stage with an adjustable feedback loop, some basic EQ applied to the feedback path, and post‑delay EQ. Adding feedback around the tape delay, to produce the now‑familiar recirculating delays, allowed the reverb tail to be extended significantly without the delay element becoming too obvious. The plug‑in version allows modulation of amplitude and/or pitch to be added to the tape‑delay stage, and also models the transformer saturation that was characteristic of this signal chain. The main live chamber, Abbey Road Chamber Two, has a moveable speaker and a left/mid/right array of three microphones, along with reflective cylindrical columns in the room that help diffuse the sound; all these are faithfully recreated in the plug‑in. The plug‑in uses modelling to replicate the electronic and tape signal paths, combined with impulse responses for the actual acoustic spaces and mic/speaker setups. This includes the original RS106 and RS127 filters used to EQ the output of the tape‑delay section. Unlike the original tape‑based system, however, there’s the added ability to dial in different left and right delay times when working with a stereo output. The half‑tiled Chamber Two is probably the most famous of the Abbey Road chambers, and is characterised by a low‑mid emphasis that gives it a quite warm sound. The plug‑in gives you a choice of two speaker types: B&W 802 has the more hi‑fi sound, while the Altec 605 has noticeably less low end. There’s also a choice of Neumann KM53 or Schoeps MKH2 microphones, plus control over where both the mics and the speakers are positioned. These parameters have quite a significant effect on the sound: putting both the mics and speakers close to the same wall emphasises the early reflections, producing a more direct sound that picks out transients, whereas a more distant spacing gives a more diffuse reverb. When the mono version of the plug‑in is active, only the middle mic signal is used. Waves also supply impulse responses recorded in the brighter‑sounding Mirrored Room, as well as the Stone Room from Abbey Road’s now‑deceased sister studio Olympic, but these don’t have a choice of speakers or mics, only a choice of near or far mic positions. As its name suggests, the Mirrored Room is fitted out with mirrors on all sides, making it bright‑sounding and very reflective. Both these additional chambers can, however, access the full STEED delay section, with its feedback and post‑delay filtering. The plug‑in GUI has a suitably old‑school look to it, with a bird’s‑eye view of the currently selected chamber and its current mic/speaker setup at the top, between the input and output meters and faders. Buttons in the centre strip select the mic type and position, which of the three chambers is in use, and the type of speaker, again with a choice of positions within the room. There’s also a control that can adjust the reverb time, multiplying the length of the IR by between 0.5 and 1.5 and thus varying Chamber Two’s normal 1.8‑second decay time over the range 0.9 seconds to 2.7 seconds. In the lower half of the window are the controls for the STEED delay section, which has its own top‑cut and bass‑cut filters plus mid‑range cut/boost, all affecting the feedback loop. There are also Drive and Mod amount controls plus a large dial for Feedback, above a numeric display for setting the delay time — with a tempo‑sync option that wasn’t available ‘back in the day’. A Link switch enables the delay values of the left and right channels of a stereo channel to be adjusted together. If left and right have different delay values, any offset will be preserved when they are linked. To the right are the output filter sections, the RS106 providing switchable top and bottom cut frequencies and the RS127 cut or boost at a choice of 2.7kHz, 3.5kHz or 10kHz. Quadrant‑style faders set the reverb chamber in/out balance and overall wet/dry mix respectively. Individual sections, including the tape‑delay Drive, can be bypassed if not required. Once you’ve chosen an appropriate chamber complete with mic and speaker options, setting up is easy enough. After setting an input level that leaves a bit of headroom, it is a matter of adjusting the tape‑delay time and feedback, tweaking the high‑ and low‑cut filters and then setting a wet/dry balance. The Reverb Chamber fader regulates how much of the signal is taken from the reverb chamber mics and how much from its input. If set all the way across to input, then you hear only the tape delay with no reverb. 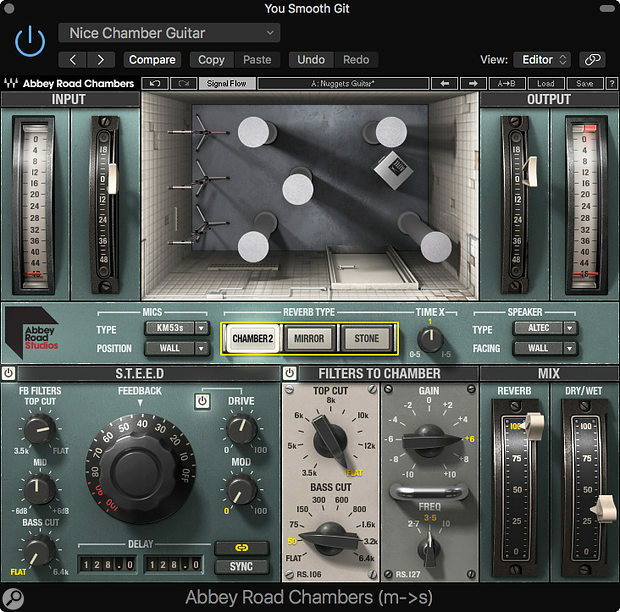 Up to 500ms of delay time is available, so it is possible to set up a useful range of tape echo, reverb pre‑delay and slap‑back echo effects as well as Abbey Road’s unique combination of tape echo and reverb chamber. In theory, you could set up a very similar signal chain using standard tape delay, EQ and IR‑based reverb plug‑ins. In fact I tried exactly that, but although I achieved some very usable results, the Abbey Road Chambers plug‑in always managed to sound more earthy and organic. This plug‑in has applications on guitars, drums, vocals and other instruments, and I’m betting it would sound really authentic on an old Dobro. I would have liked separate modulation speed and depth controls but I’m guessing that things are done the way they are to maintain authenticity. Whether you need Abbey Road Chambers or not depends very much on the type of music you make, but anything with a vintage pop, rock, blues or rootsy flavour would certainly benefit. All the original hardware is modelled to recreate the STEED signal path. Parameters for the Mirror Room and Olympic Stone Room are more limited than for the Abbey Road Chamber Two. Abbey Road Chambers is an easy-to-use package of audio nostalgia that can add a vintage UK vibe to your recordings.